1987 E CHEVROLET TRUCK, 4DR DI..
1994 NISSAN PATROL 4.2 DIESEL ..
1975 MERCEDES-BENZ 306 DIESEL ..
1969 MERCEDES BENZ 280 SL W113..
2005 HUMMER 6.0 AUTO SUPERCHAR..
1994 CHEVEY 6.5 TURBO DIESEL S..
1997 CHEVROLET SUBURBAN 6-5 TU..
MERCEDES BENZ LIMO 500 SEL STR..
1990 RENAULT 5 GT TURBO (purpl..
1967 MERCEDES BENZ TRUCK 5-7 T.. In keeping with the family tradition Lee J Farrell, his twin sons Daniel & Denis, and his late Father have had a passion for Classic Cars for over 40 years. Their commitment as an enthusiast to Classic Cars is borne out by the large range of classic cars personally owned by them over the years, including rare Mercedes benz, rare vintage cars and American muscle cars, living the dream and wise investments. 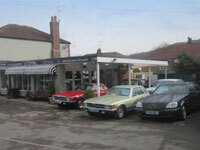 As a classic car dealer our experience and knowledge has gained an enviable reputation within the trade and their broad range of contacts and experience enables Classic Cars Manchester to comfortably state that they are a down to earth, reliable, honest family business. The contacts knowledge and sources we have built up over many years allows Classic Cars Manchester to provide you with the opportunity to purchase an appreciating investment in cars that can be cherished and loved whilst increasing in value. Classic Cars Manchester has been serving the Manchester, Stockport, Cheshire and surrounding areas for many years and is an established and respected authority on all aspects of classic car and vintage cars, purchase, sales, investment, repair, restoration and sourcing. Our staff offer quality and reliable advice you can count on. In addition, we are here to answer any questions you may have about our company. our services or our classic cars. If you need advice call. Whether you need a Ferrari, Lamborghini, Aston Martin, Lancia, Mercedes Benz, an American car, Ford or a Rolls Royce, we have what you need at prices you can afford. At Classic Cars Manchester, our goal is to provide you with courteous, expedient, professional service of the highest caliber. At Classic Cars Manchester, the customer always comes first. We use our local MOT station called Alldis St Mot centre in Great Moor Stockport SK2 7NR. They are a classic car and motorbike specialist centre. Every car we sell has a full & comprehensive pre-delivery check up and service and any faults found are systematically rectified through our local independent Mercedes specialist. 10 London Rd South, Poynton, Stockport, Cheshire, SK12 1N1. We do our very best to make sure the car your buying from us is sold to the highest standard.